The Eagle Fun Days parade is an annual tradition that travels down the eastern end of Old State Street. 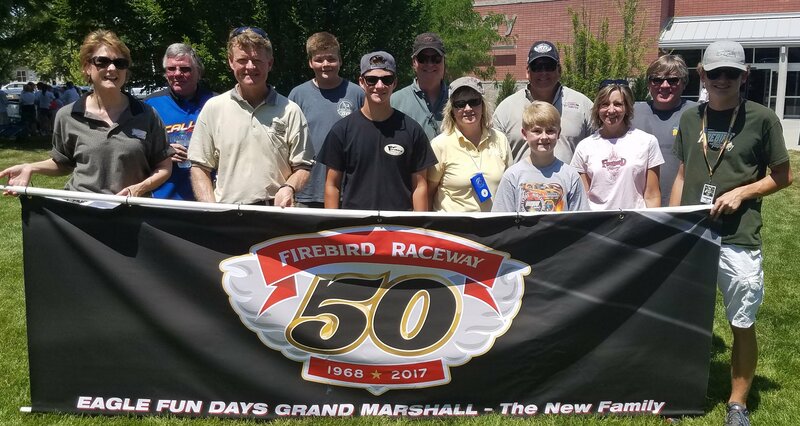 As a special treat in 2017, Mayor Stan Ridgeway invited the New family to be the grand marshal of this year’s parade in recognition of the 50 year celebration of the raceway. 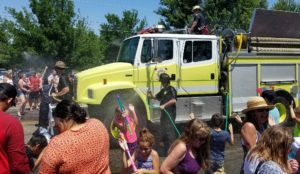 One of the unique features of the parade is the deluge of water sprayed by apparatus up `n down the course. To no surprise kids and families attend this event by the thousands every July. The water was more than a welcome relief with the blistering hot Summer-time conditions. The New Crew drove two of their Forty Fords behind the color guard at the head of the parade. They were joined in the line up by the Treasure Valley-based “High Heaven” AA/Fuel Altered of Hughie and Shawn Callen. Candy was tossed to the many attendees, along with special commemorative Firebird Hot Wheels diecast cars. Thanks again to the City of Eagle for their extending all of us in the New Crew an invite. Scott, Debbie, John, Anna, Connor, Colin, Brad, Katie, Austyn and Matthew (pictured above with the Callen duo) participated in the parade activities.